It has ridges of very hard skin (see those lines) and well they’re meant to be peeled away. 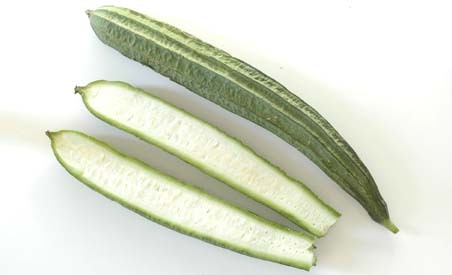 Inside is white, almost like a zucchini but sweet gourd is spongier and lighter. I’ve see my mum cooked it long time ago and she usually peels off everything till it shows a little of the skin. The outer skin is usually very hard and leathery, so it’s better to peel it off. This are cut into wedges already. Somehow they are like sponges, they absorb the liquid or stock or broth from the dish and it becomes extremely soft and nice to eat. 1 tsp corn flour mixed with 2 tbsp of cold water for thickening. 1. Cut the tofu in half. Remove egg tofu from wrappings, slice lengthwise into half again, then you’d have 4 pieces from each egg tofu. Heat oil in work and deep fry tofu. It takes quite a while for it to turn to golden brown. Dish and drain. Arrange onto serving plate. 2. 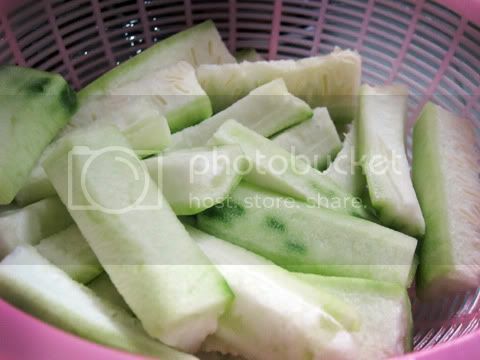 Remove skin and ridges from gourd. Cut into wedges about 2-3 inches length. 3. Heat up 1 tbsp oil in another pan, saute chopped ginger and garlic until fregrant. Add in sweet gourd and stir well. 4. Pour in seasoning and cook for 4-5 minutes. The sweet gourd would absorb all the broth and soften up. 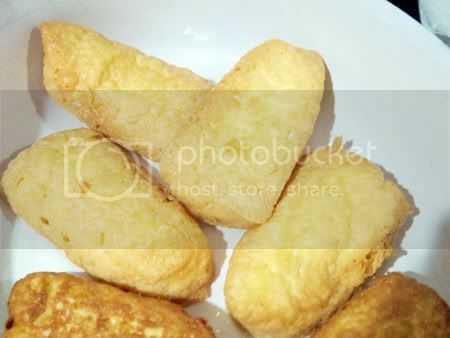 Thicken with corn flour water and pour over fried tofu. Incase you’re wondering what the white stuffs are, they’re egg whites. After I thicken with corn flour, I stream in an egg white and stir for a couple of seconds before dishing it up. 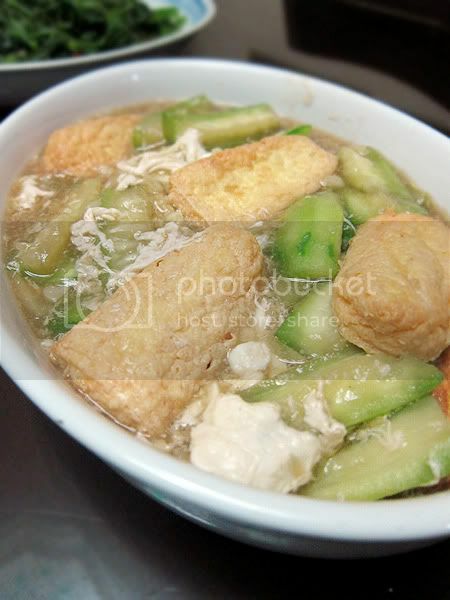 It’s a nice vegetarian dish, or if you’re bored with eating just green veges by itself, add some tofu to it, just like this dish. 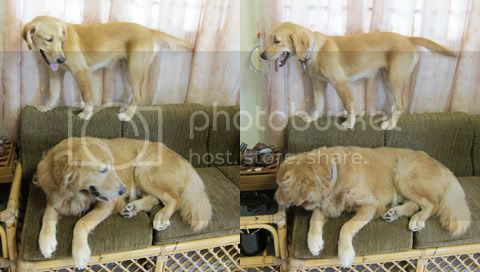 I tell u . this little fella have this idea of standing on the sofa just like that. 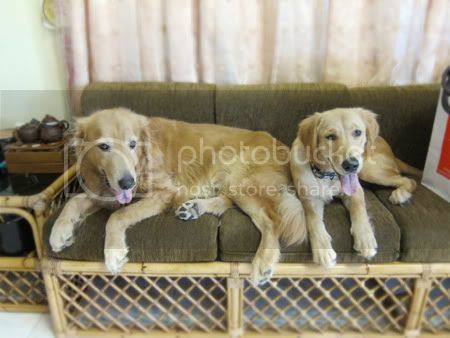 Admittedly, it’s quite a hard piece of sofa but still….. !!! WAh They finally sat still for me to take a picture!! Do they look alike ? They have the same colour of coat tho.. Which I like.. wheee … OK I’ll try to take a pic of my other favourite dog aorund my neighbourhood. he’s a goldie as well he’s really like a BIIIGG round furball with super round eyes. You may choose to post or not to post this. Oh thanks Wendy, Why would I not post this ? I think it's a good information for other people too. I saw this recipe from a cookbook so I assumed it was sweet gourd since it says so. Let me assume that it's a local chinese publication translated into English?? ?